An idyllic backdrop for Morro Bay, Morro Rock is the last of the (Nine Sisters) extinct volcanic peaks along Highway 1 from San Luis Obispo. This 576' tall landmark stands at the mouth of our harbor and is home to nesting Peregrine Falcons. 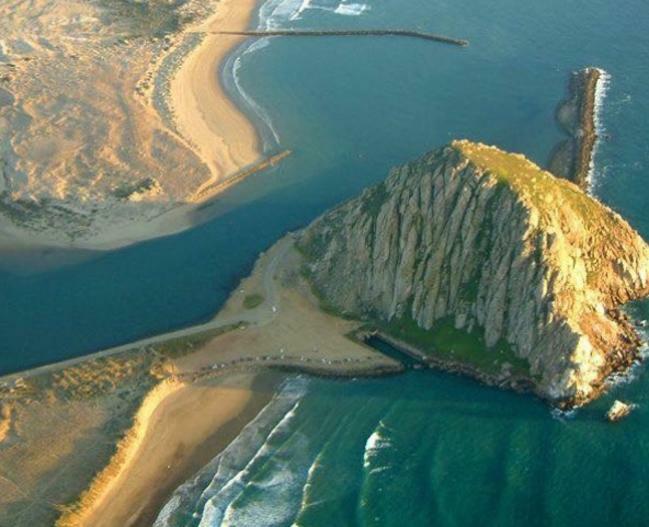 You can drive to the base of Morro Rock by way of the Embarcadero Road and heading north (right). A large parking lot consumes the base of the Rock with restrooms and cold showers. Please note: climbing is prohibited. Leashed dogs are allowed on the beach up to the Atascadero Rd access trail.